I love racing games and although I am happy to use a standard joy-pad controller for most games, its just not right for driving games. A proper wheel with pedals is the only way to go. When you drive a real car, you don’t have a button that’s on or off for an accelerator or brake, you have a pedal that you can be held at 70% through a corner, and then planted at the apex. You can modulate the brake when your on dirt to prevent lock up. A switch just doesn’t give you that control. I have wanted the Logitech G27 Wheel since I first found out about it. My previous Xbox wheel I had broken part of one pedal because they were made of plastic, and after repeated use it developed a crack and then broke. The Logitech G27 Wheel features metal pedals and metal shifters on the steering wheel, so its built to last. The Logitech G27 Wheel has a clutch pedal as well as brake and accelerator pedals. The games I have been playing haven’t supported this but I will find one and can’t wait to use that feature. The wheel itself is fitted with leather and this makes ahuge difference when I’m using the Logitech G27 Wheel for extended periods. My old wheel had a rubberised finish that got really grubby when I played for a long period, especially on hat days when you tend to sweat more.It feels the same as my leather Momo wheel in my car. The Logitech G27 Wheel has 2 force feedback motors, and they are extremely strong motors. The force feedback simulates the things you feel through the wheel, like you would feel in a real car, like bumps and even cornering forces. The default setting I found way to strong, as I felt the wheel was trying to rip itself out of my hands. I adjusted it down to 30% (from 50%) and it feels great now. The strength of the motors is great as it should mean years of faithful service. Although strength is important, whats really nice about the Logitech G27 Wheel is how smooth they are. The twin motors feel so natural and smooth that the force feedback effect feel very natural. The pedals have a strong spring and feel very responsive but the spring isn’t to strong, as that can make extended sessions tiresome on your feet. I have to say that Logitech have got this wheel right. I have owned several wheels over the years and my favourite before this one was the Logitech Wingman formula force wheel. This is an awesome wheel but is PC only and as my old PC wasn’t a gaming rig, I could only play certain old games with it. 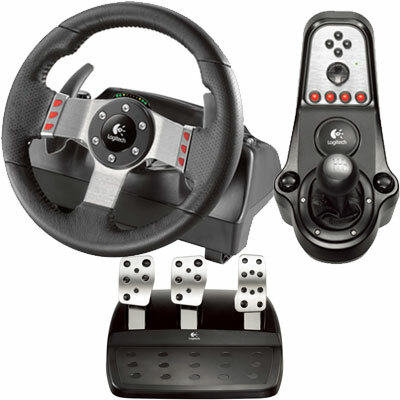 The Logitech G27 Wheel is great for both PC and PlayStation 3 . I tend to use the PlayStation 3 more than my PC for gaming, but being able to use same wheel for both is a big plus for me. I am building a special mount for the Logitech G27 Wheel , so I can use it mounted to my office chair similar to this click here . I’ll post up some pics once I get it made. I looked around online for a price and although I could have saved a few dollars, I ended up buying mine from a local company called Scorpion Technology . They had a a great price, were close, and I could get it that day. This is a very expensive wheel but it is an awesome wheel and worth every cent if your like me and love your driving games.